Kevin Mitnick, the world's most famous hacker, teaches you easy cloaking and counter-measures for citizens and consumers in the age of Big Brother and Big Data.Like it or not, your every move is being watched and analyzed. Consumer's identities are being stolen, and a person's every step is being tracked and stored. 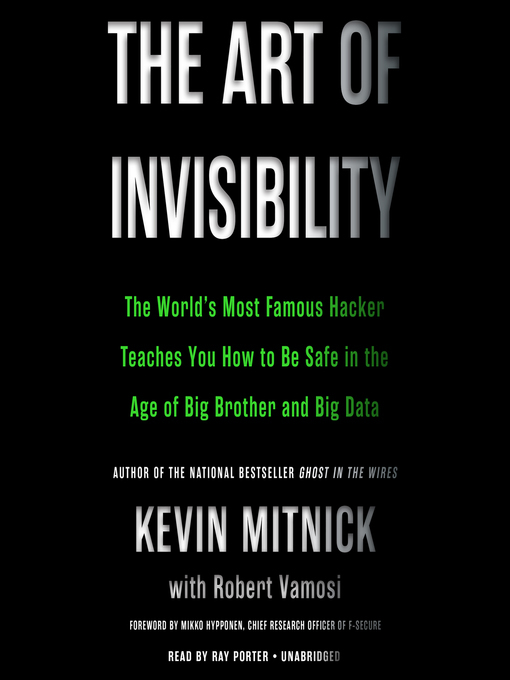 What once might have been dismissed as paranoia is now a hard truth, and privacy is a luxury few can afford or understand.In this explosive yet practical book, Kevin Mitnick illustrates what is happening without your knowledge—and he teaches you "the art of invisibility." Mitnick is the world's most famous—and formerly the Most Wanted—computer hacker. He has hacked into some of the country's most powerful and seemingly impenetrable agencies and companies, and at one point he was on a three-year run from the FBI. Now, though, Mitnick is reformed and is widely regarded as the expert on the subject of computer security. He knows exactly how vulnerabilities can be exploited and just what to do to prevent that from happening. In THE ART OF INVISIBILITY Mitnick provides both online and real life tactics and inexpensive methods to protect you and your family, in easy step-by-step instructions. He even talks about more advanced "elite" techniques, which, if used properly, can maximize your privacy. Invisibility isn't just for superheroes—privacy is a power you deserve and need in this modern age.